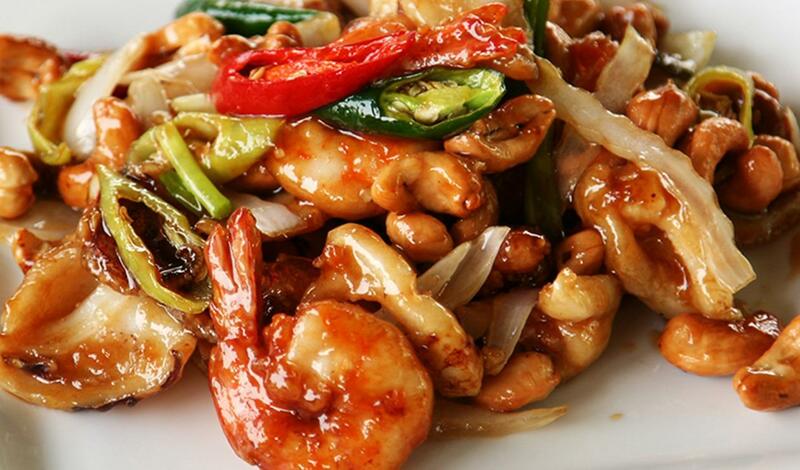 Authentic crunchy prawns and cashew dish. Serve with white rice. Heat a wok and add the vegetable oil. Reduce the heat to medium, add the prawns and stir-fry for a few seconds, just to set the corn flour mix on to the prawns. Cool the prawns and store in the refrigerator. In the wok on high heat stir fry the ginger, garlic and dried red chilli. Add the soy sauce, ZhenJiang vinegar, sugar and prepared Knorr® Professional Liquid Concentrated Chicken Flavor Base. Boil to reduce the sauce a little. Cool the sauce and store until ready to use. Fry a portion of the part cooked prawns in sesame oil. Add a portion of the scallions and cook two minutes. Add a portion of sauce, heat through and allow to reduce slightly. Plate with side of steamed rice. Garnish with cashews and a drizzle of sesame oil.